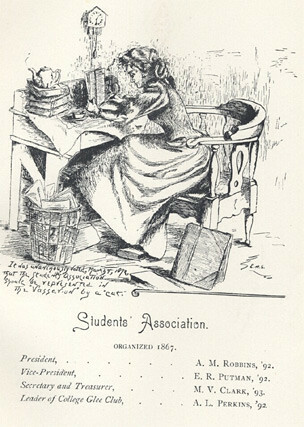 In 1868, the Student Association, Vassar’s first student government, came to order. One tremulous genesis and several major transformations later, the ongoing evolution of Vassar’s student government still reflects kindly on Matthew Vassar’s unprecedented commitment to women’s education and his legacy of higher learning. Women’s education was still a speculative enterprise when Milo P. Jewett, future president of the college, suggested that Mr. Vassar, then a wealthy businessman, use his fortune to endow an all-girls college. In strong support of such an endeavor, Jewett recommended that Vassar “build and endow a college for young women, which shall be to them what Yale and Harvard are to young men.” Further qualifying his point, Jewett continued, “There is not an endowed college for women in this world. We have plenty of female colleges (so-called) in the country, but they are colleges only in name.” With this in mind, the inception of Vassar College seems all the more special. With no established precedent to model after, Vassar College stood in a league of its own – the college was founded ten years before sister schools Wellesley and Smith, twenty-seven years before Mount Holyoke. As the prototypical women’s college, Vassar was poised to set the standard in women’s education for years to come. From its inception, “the trustees and president… constituted the only authority… to determine educational policies, the appointment of professors and the academic regime in general.” The agency of the students were kept in check by the school's duty to serve in loco parentis. Take Vassar’s first curriculum for instance. Under the guidance of John H. Raymond, the college’s first active president, the students were exposed to mathematics, science, and modern languages in line with the rigorous curricula of other established schools; however, Raymond was also inclined to believe that girls needed domestic training to prepare them for the future, including flower arrangement, telegraphy and interior decorating. Similarly, when it came time for the students to petition for student organizations, some suggested that even debate was “utterly incongruous and out of taste” for an all-girls school. On February 22nd, 1868, the student government was formed to prepare for the annual Founder’s Day celebration. Though their first assignment as a governing body was a bit lackluster, the students were still eager to explore the boundaries of their newfound independence. Reflecting on the ad hoc formation of the group, a student wrote in the Miscellany: “Its constitution contained merely a conventional statement of name, officers and procedures. No definition of aim or scope was suggested.” Though their intentions were noble, the students were not yet in a position to make important changes on campus. Aside from establishing a Glee Club and Library Committee, the government was relatively ineffective. A glance at the students’ minutes from this period reveal their admirable attempts at self-governing. In 1871 hissing was “abolished” from debate, while clapping remained in favor; soon afterward the consumption of peanuts during meetings was prohibited. (1) These most seminal years were characterized by well-meant, yet ultimately toothless pronouncements. In 1889, during the first year of President Taylor’s tenure, the SA was granted a limited self-government. Though President Taylor would not prove to be the boldest proponent of student government, it was under his leadership that the SA found its legs. This new arrangement allowed the students to regulate and manage the rules created by the faculty and administrative board. It was also during Taylor’s term in which the SA began their first philanthropic initiatives. The establishment of the “Maggie Fund,” a monetary donation made towards the education of a local Poughkeepsie girl, was the first of such initiatives. Others would follow, including an effort to raise money for the entertainment of the campus maids in 1889, patronage to the Women’s War Relief Association in 1897, monetary support for women’s education in Spain, and fundraising for the construction of maids’ quarters in 1901. The concessions made by Taylor and the trustees would not satisfy the students for very long however, as they pushed for even more autonomy in the 1901-1902 academic school year. The charter of 1902 paved the way for even greater liberties to be taken by the SA. In 1913 the organization revised the charter of 1902 with two major changes. The students were allowed to regulate all non-academic student activities, including clubs and extracurricular programs. Furthermore, the SA declared that amendments to the constitution could be made with a three-fourths majority vote. As an offshoot of the budding independence the students’ enjoyed, an honor system was officially established in 1918. The system was suggested as a means of instilling personal responsibility in the student body, which still felt the tight grip of in loco parentis, both in and outside of class. Though it has undergone some revisions over the years the honor system remains an emblematic reminder of Vassar students’ insistent autonomy. The burgeoning influence of the SA, and several other progressive changes in school policy, may be credited to President Henry Noble MacCracken. In reference to President Taylor’s tenure, MacCracken argued that Taylor wanted to shape the students of Vassar “not [into] leaders, but good housewives and mothers, truly liberal in things intellectual but conservative in matters social.” MacCracken’s keen awareness of conflicting trends in Vassar’s history informed his aspirations for the college. During his tenure, MacCracken revitalized the school with a fresh new perspective on education. He was once quoted as saying “If you want students to respond to their opportunities at Vassar, make them responsible. There is no other way.” MacCracken’s willingness to cooperate with student government led to even greater student liberties. In 1924 a grant of powers was issued to the students. The new policy allowed the SA to add important revisions to their constitution, including the formation of judiciary and legislative bodies. Their creation helped pragmatize the government’s efforts, altogether making it more effective. The “Grant of Powers from Faculty,” the official name of the students’ statute of governance, was renewed every three years for as long as President MacCracken was in office. His progressive views on women’s education motivated the students to push farther than they ever had before, as evidenced by the association’s drastic reforms in 1947, just one year after MacCracken’s retirement. The organization appeared for the first time as the College Government Association (CGA) in the 1947-48 Student Handbook, during the start of President Blanding’s tenure. The name channeled the new cooperative spirit existent between faculty and students. Included in their constitution was a detailed list of duties and responsibilities between the three spheres of college power – student, faculty and joint. The faculty’s exclusive power resided in issues concerning the curriculum, the degree, the library, public relations and fire safety. The students presided over all student, major, house and class organizations, as well as census systems. The realms in which they shared jurisdiction included the honor system, freshman orientation, student advisory committee and future policy on cooperative administration. Paving the way for its successors, the CGA made headway in furthering the students’ agenda. Listed within the 1947 Vassarian is an assortment of student-run organizations spanning a broad array of interests, all of which were under the umbrella of CGA. Among them were Philaletheis, the school’s drama club, the “Vassar Brew” and “Present Tense,” both literary magazines at the time, the Classical Society, Philosopher’s Holiday, the Political Association and Debate Society. This pluralistic offering of clubs and interests was indicative of the student body’s growing sense of independence. 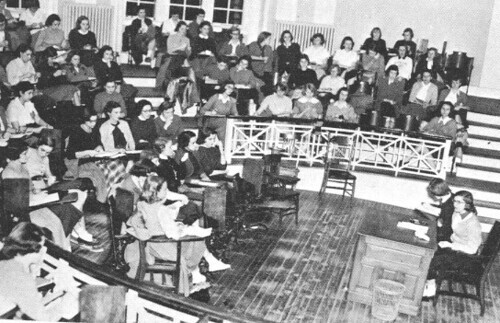 The 1940s proved also to be a period of cultural awakening for the student body. The students’ socio-political consciousness was vastly enlarged by the atrocities of the Second World War. 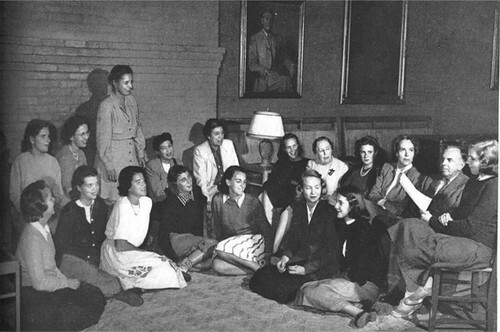 In 1947 the students of Vassar College joined forces with the National Students Association (NSA) in light of their renewed global awareness. The NSA provided an outlet in which students could discuss pressing issues of the day, and seek constructive resolutions. Moreover, it offered its members a forum in which the state of student government may be constantly reevaluated to guarantee its optimal performance. Vassar’s participation in NSA undoubtedly helped it come of age politically in the years to come. The success of the CGA continued far into the 1960s. In 1965 “The Grouse,” a questionnaire modeled after a popular survey used at Swathmore College, was introduced at Vassar to gauge the student body’s feelings on particular topics of interest. Included within the five page questionnaire were queries broken into categories such as academic concerns, library, advisors, being heard, recreational concerns, the Misc, social events, residential issues, health concerns and CGA effectiveness. Though some students questioned the validity of The Grouse’s findings (due to its “flippant” sarcasm, as one student put it,) it nevertheless revealed the student body’s most widespread issues with the college. Among those polled, 361 students were dissatisfied with the student-to-teacher ratio while only 128 found it satisfactory. Other concerns included the direction of the curriculum, the influence of student input on faculty members and mounting tuition fees. Despite the bleak portrait these results depict, the 1960s were primarily a transformative period in Vassar history. In a decade fueled by upheaval, dissent and protest were signs of growing political awareness on campus. In 1968 students, trustees and faculty converged at the Minnewaska Conference at Lake Minnewaska in Southern New York to encourage greater communication between the aforementioned parties. The student delegates argued for greater involvement in the affairs of the college. Among the topics discussed by the assembly was the impact of student feedback on the curriculum as well as their influence on faculty selection. Perhaps the most decisive victory for the students at Minnewaska was a unanimous agreement to do away with the doctrine of in loco parentis, which had clearly run its course by the 1960’s. By the late 1960’s, the student government was clearly a force unto itself. The 1969-1970 Student Catalogue described the government as a “separate entity within the corporate community;” a first for the organization. That same year, the CGA was reorganized as the Student Government Association (SGA). Like its predecessor, the SGA represented an organizational shift; while the government was more willing than ever to cooperate with administration, the name suggested a new form of independence – this government would indeed operate for, and belong to the students. Important constitutional changes that occurred this year include the revision of student court jurisdiction; a more detailed system of appeals; the inclusion of recall, initiative and referendum; the creation of a Student Activities Committee to coordinate student run events; and most importantly, the acquisition of seats on the Curriculum Committee. This last change made certain that true consideration for the students’ academic concerns would be implemented. Several changes to the curriculum were made between 1968 and 1970 including the withdrawal of mandatory physical education, the expansion of ethnic studies departments, and the introduction of a Pass/Fail system in which students could forego their final grade in favor of a satisfactory or unsatisfactory mark in up to a quarter of their classes. Vassar’s adaptability may also be seen in one of its more recent enterprises – coeducation. When it came to student government, however, the inclusion of men was a non-issue. Since 1970, when men were first included in the freshman class, the trend has been towards gender equity. More specifically, the students have never made much fuss over the gender of their fellow club and office members. Generally the gender of elected officials has varied by year, but only because of the students' impartiality. Though coeducation has forever changed the composition of the college, the principles Vassar has stood by since its founding remained intact. The student body continued to urge reform where it was due. During the Vietnam War, Vassar students directed their attention towards the world at large. The Vassar Committee for Peace, an organization supported by the SGA, organized protests against the war and American Imperialism. Back at home, the students’ social consciousness was fixed on heated racial questions of the day. In 1971-2, Kendrick Hall was at the center of one such quagmire. The issue arose out of concerns that Kendrick Hall was becoming an exclusively black dorm. The administration, forced by state regulation to intercede, had to reject a proposal put forward by the SGA asking for a majority of students living within Kendrick Hall to be of black descent. The SGA, representing its constituent parts, argued that their aim was not segregation, but to preserve a cultural core in which black students might nurture their heritage. In a memorable moment of solidarity, nine separate SGA organizations and affiliates including the Exec Committee, the Senate, the College Council and Social Action Committee supported the Kendrick experiment. In another instance of student initiative, Vassar’s own Taylor Hall was pushed beyond its maximum capacity on December 16th 1973, according to the Miscellany News. The congregation of over four hundred comprised of students, faculty, trustees and administrative personnel came together to discuss Vassar’s educational and financial priorities. Among the topics discussed were rising tuition costs, the expansion of several ethnic and multidisciplinary courses and concern for the diminished size of faculty. Some students were so bold as to demand the resignation of Vassar President Alan Simpson. The attendees’ response came as a surprise to many members of the administration – the meeting reminded both sides of the discussion that school policy is contingent on the opinions of the students as much as it is on the administration. These moments remain benchmarks in Vassar’s long history of speaking up and acting out for the sake of fair representation. During revisions of the constitution in 1979 students decided to change the organization’s name to the Vassar Student Association. Through the students’ initiative and hard work, the VSA proved to be just as, if not more effective, than its previous incarnations. In 1983 meetings were held to discuss minority admission practices, the state of co-ed housing, financial aid policies, and the influence of students on the tenure system. As the voice of the student population, the VSA continued to help shape the policies and regulations of the college. Through its distribution of funds to several dozens of clubs and interest groups on campus, the VSA has become a permanent feature in the Vassar landscape. As of today, the student government’s influence pervades all facets of the college experience. It not only acts as a liaison between students and college administration, it also serves as a galvanizer, a space in which students may come together and freely express their sentiments with the rest of the campus. 2. )As attitudes within the college softened, the students branched out in other impressive ways; during the 1902 scholastic year, Vassar held its first intercollegiate debate with Wellesley and won. The topic was “Resolved: that it would be advantageous to the United States to subsidize the Merchant Marine.” Vassar upheld the negative for the win.